After you graduate, you can continue to access the Careers Service for up to three years. This includes access to the CareersHub. For more information, please visit our careers pages. You can also look for temporary or part-time opportunities via Unitemps. Or if you’d just like to expand your professional network, why not come to one of our alumni events? City's Professional Mentoring Scheme offers professionals the opportunity to inspire and guide our students through a six or nine month one-to-one mentoring relationship. Since 2002 the scheme has successfully delivered 1,567 mentoring relationships between professionals and City students. On average the scheme brokers 400 mentoring pairs per annum. With 71 per cent of our mentors City alumni, 13 per cent City staff, and 16 per cent referred to the scheme or recruited by staff, we engage a diverse range of professionals who volunteer their time to mentor our 2nd and 3rd year undergraduates and Masters students. 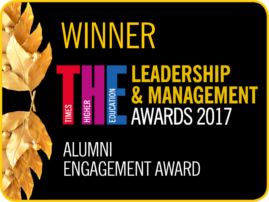 In 2017 the Professional Mentoring Scheme won a Times Higher Education Leadership and Management Award. The Alumni Relations team would like to encourage our alumni to join this hugely rewarding scheme. To hear first-hand what it's like to be a City mentor, please read alumnus Tony Rimoldi’s blog feature. For more information or an application form please visit our mentoring pages. Our online vacancy portal is free of charge and the easiest way to advertise graduate vacancies, placements, internships and part-time or casual work. All our students are registered to use this service. You can also reach recent graduates up to three years from graduation. For more information on how use this service, please contact our careers team. Or sign up for free via CareersHub. Alternatively we can post a job ad for you to over 9,000 graduates in our LinkedIn groups. Please contact alumnicomms@city.ac.uk with the details of the vacancy, including a link to apply. If you would like to recruit a City student or graduate on a temporary basis please visit Unitemps. Unitemps is a university-owned recruitment solution that both advertises and recruits for temporary or part-time work opportunities. As a City alumnus you can access a comprehensive range of business services from academic expertise, continuing professional development and state-of-the-art technical facilities to consultancy, technology licensing and contract research. Find out more about Business Services. If you are planning to start your own business City supports our entrepreneurial students and alumni to develop and launch their business idea. Find out more about CityVentures.